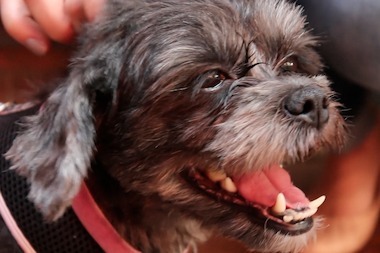 LINCOLN PARK — The dog trimmed of nearly 2 pounds of urine-soaked fur has a new home. Ellen, who was rescued by the Lincoln Park-based Trio Animal Foundation in July and received 274 applications for her adoption, was officially adopted recently. The owner, who lives in Chicago but wished to remain anonymous, also rescued a 3-year-old terrier mix named Linus, who instantly became Ellen's best friend. "When Linus saw her, it was an instant connection," said Sue Naiden, president of Trio. She served as Ellen's foster owner until she was adopted. "These two pretty much picked themselves." Bridgid Nolan, director of Trio's Project Rescue Chicago, said the 274 applications were the most for one dog in the organization's history, easily topping the 179 for a pit bull named Hippo. Nolan said virtually every Chicago neighborhood was represented in the adoption process, and applications also came in from Greece, England, Australia, Chile and Mexico. "Any time people see abused dogs, they want to do everything they can to help them," said Nolan, who lives in Portage Park. Nolan said Ellen's abuse was among the worst cases of neglect she has seen. 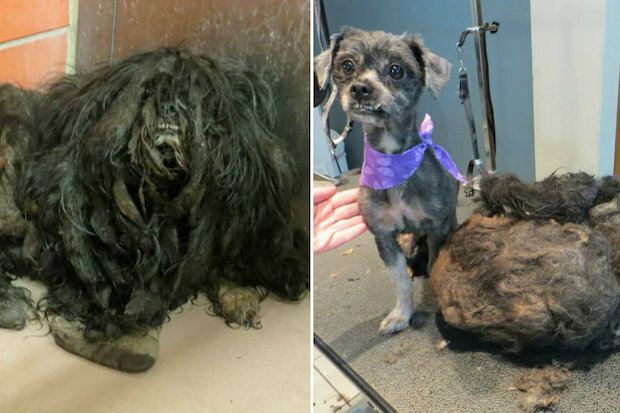 Ellen, who weighs 8 pounds and is believed to be a shih tzu-terrier mix, was described as a dog with "a clump of pungent urine-soaked matted fur" when the foundation obtained her from a South Side shelter on July 13. "We couldn’t even figure out if the dog was a male or female," read a foundation Facebook post titled "FROM HELL TO HEAVEN … ELLEN HAS GOTTEN HER LIFE BACK!" The post was shared more than 11,600 times. "When we first saw this dog in its cage, we didn’t know which end was front or back. We had to get a treat to see which end lifted up to sniff," the post read. "As it turned out, the dog had two very petite legs hidden underneath all the knotted fur, and the outer appendages were just matted fur and debris." A groomer from Mutt Hutt spent 1½ hours shaving 2 pounds of fur from Ellen, who was then given a bath and another trim. "We thought she was dead," Naiden, of Lincoln Park, said Tuesday while Ellen played with Linus, who was rescued from Dodger Stadium in Los Angeles. "The vet couldn't even help her because they couldn't get through her fur." Naiden and Nolan both said they wanted to adopt Ellen, believed to be about 2 years old, to a local person with good intentions. "A lot of times, people wanted her for her story, but not for her," Naiden said.